Are these interesting results? If yes, worthy of publication? I don't remember exactly when I had the idea I describe in the following, but I clearly remember I had a conversation about it with Ryan Chisholm (now at the National University of Singapore) while attending the SIAM meeting in San Diego in the summer of 2013. Marc Mangel was invited, but he could not go. The organizer of the special session on spatial ecology asked Marc if he had a postdoc to recommend as a substitute for him and he recommended me. Semi-surreal experience with only the five people scheduled to give talks present in the room and a couple of them were busy checking emails. I had a very good time, though. 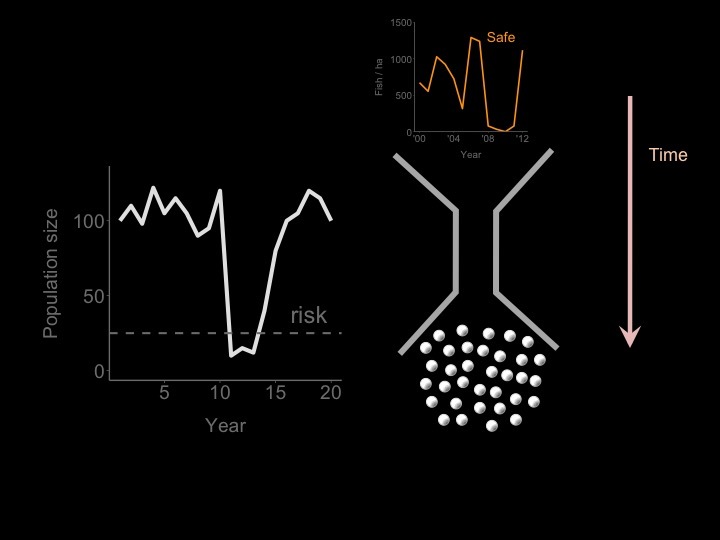 As a side note, I recently had a look at the slides of the talk I gave at SIAM 2013, and there are at least a couple of ideas that could become papers, one on density dependent growth at different spatial scales (which I had partially developed Vincenzi, S. et al. 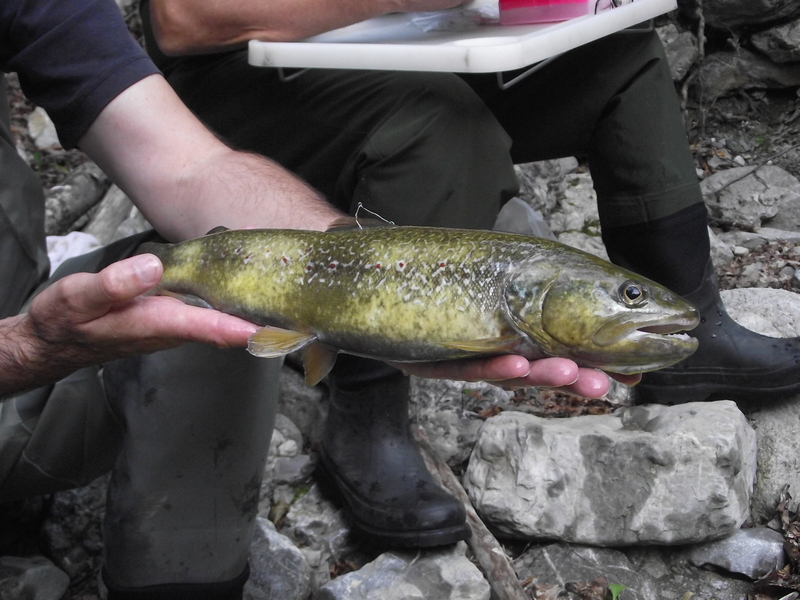 2010 Detection of density-dependent growth at two spatial scales in marble trout (Salmo marmoratus) populations. Ecol. Freshw. Fish 19, 338–347) and one on rapid genetic differentiation in fish populations living in fragmented habitats. Ryan also talked about his recent (at the time) trip to Cuba and he convinced me - it was not too hard - to visit the island. I went to Cuba for the first time in November 2013, I fell in love with La Habana, and I have been there other 2 times, the last one (October-November 2016) also presenting my research at the Centro de Investigaciones Marinas of Universidad de La Habana. In La Habana at the beginning of November 2016, humidity at 150% and not too happy about it. How can we define an event as extreme? As I wrote in a 2014 paper (Vincenzi, S. 2014 Extinction risk and eco-evolutionary dynamics in a variable environment with increasing frequency of extreme events. J. R. Soc. Interface 11, 20140441), "[...] extreme events may be defined in terms of extreme values of a continuous variable on the basis of the available climate record (e.g. temperature, precipitation levels) or in the form of a discrete (point) perturbation, such as a hurricane or a heavy storm. This latter category also includes environmental extremes such as unusually big fires, aseasonal floods or rain-on-snow events.". 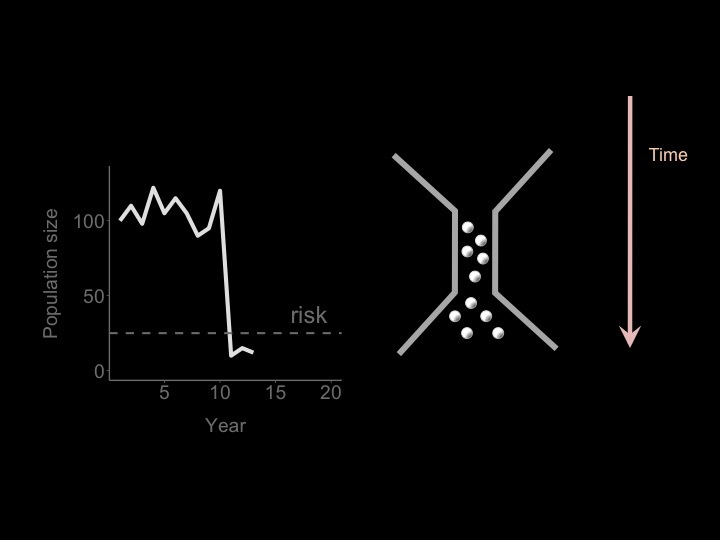 Extremeness includes and goes beyond rarity, and we can assume extreme events to be defined as extreme have recurrence intervals that are longer than the generation time of the species we are investigating. 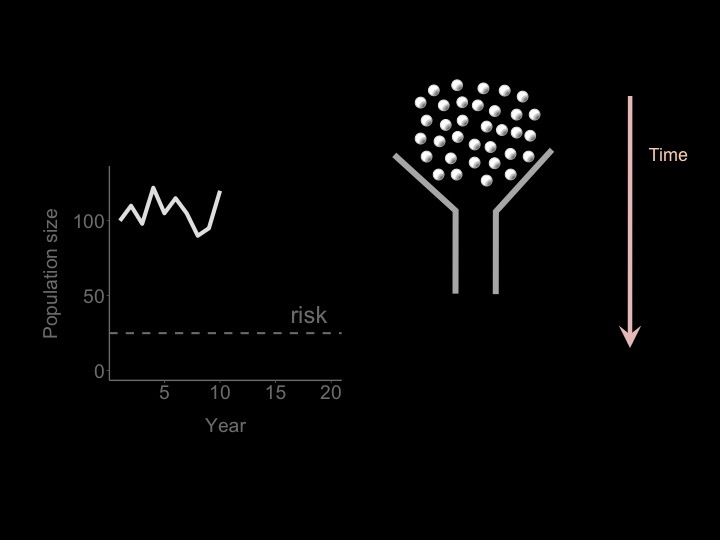 It follows that if we are interested in the effects of rare events, the minimum duration of the monitoring program is dictated by the expected recurrence interval of the extreme event, but if in absence of extreme events (that is, extreme events are not expected for that species/population) we want to estimate "reliable" average survival and growth rates (which along with recruitment represent the main axes of variation in species' vitals rates and are essential for the development of any self-respecting model of population dynamics) is unclear for how long we need to go on with the monitoring program. I am not the first one to think about this problem in conservation biology, see for instance Chapter 23 of "Design and Analysis of Long-term Ecological Monitoring Studies" (many editors): "Choosing among long-term ecological monitoring programs and knowing when to stop" by Hugh P. Possingham, Richard A. Fuller, and Liana N. Joseph, or Gerber, L. R., M. Beger, M. A. McCarthy, et al. 2005. A theory for optimal monitoring of marine reserves. Ecol Lett 8, 829–837. 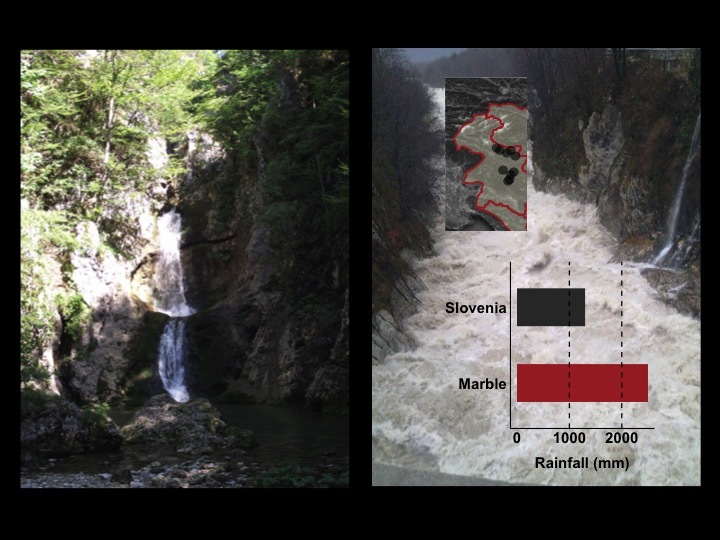 In practical terms, I was interested in estimating how stable were the estimates of average, maximum, and minimum (for a sampling interval) survival rates, and somatic growth rates (i.e., body growth) over time in populations of marble, brown, and rainbow trout living in Western Slovenian streams. 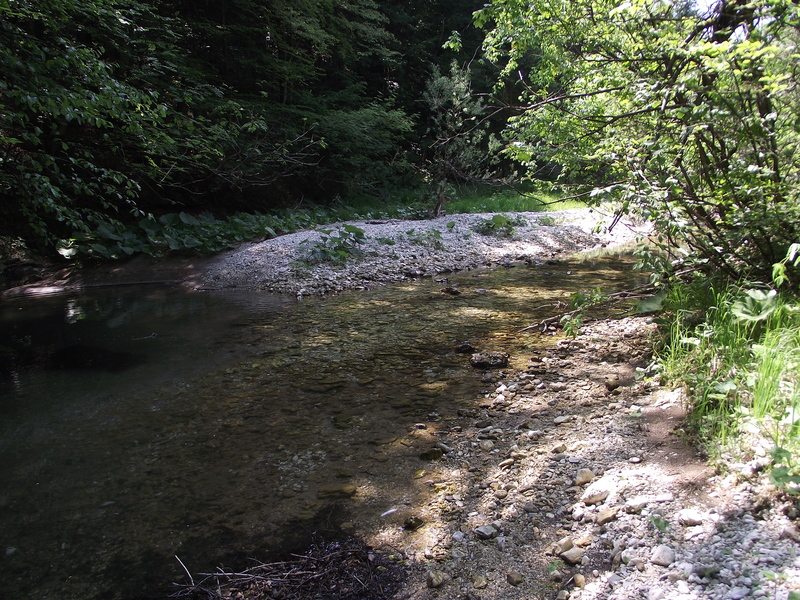 Briefly, two populations of marble, one of brown, and one of rainbow trout were sampled bi-annually (June and September) between 2004 and 2014 (monitoring is still ongoing, but for various reasons in this study I only included data up to 2014). Those populations were not affected by extreme events since the start of the monitoring program. It is tricky to assess what's "stable" since we estimate rates or probabilities, thus we inevitably have uncertainty in the estimation, but let's put aside this thorny problem for a moment with the assumption we can at least qualitatively see or define "by look" what's stable or not. Without getting deep into the gory details (and there are many), what I did was to fit capture-recapture models (fish were tagged when bigger than 115 mm) of survival and growth (using von Bertalanffy's growth models) with data available after 3, 4, 5 (and so on) years since the start of the monitoring program. For growth, I used two von Bertalanffy's models, one with random effects (see Vincenzi, S. et al. 2014 Determining individual variation in growth and its implication for life-history and population processes using the Empirical Bayes method. PLoS Comput. Biol. 10, e1003828) and one "classic", that is without individual random effects (I simply used the nls function in R, thus each data point is - wrongly - assumed to be coming from different individuals). For survival, I fitted models Phi(~1) (constant survival) and Phi(~time) (survival varying for each sampling occasion) with different models of probability of capture. With Phi(~time) models, I had the goal to estimate the maximum and minimum survival probabilities over sampling intervals (apart from statistical noise or use of different models of probability of capture, over time maximum survival probability for a sampling interval cannot become smaller and minimum survival probability cannot become bigger). These are the results for growth, I took asymptotic length (of the average fish) as estimated response variable (estimates with classic nonlinear regression (dot symbol) and estimates with the model with random effects (triangle)), x-axis is the last year of sampling (for, say, 2006, I only keep the data for up to 2006, for 2010 up to 2010, and every time I re-fit models with the corresponding datasets). With the model with random effects, it takes 2 to 4 years to obtain a stable estimate. With the classic method, we need more years, and in some cases, the model gives wrong estimates, since outliers strongly pull the average growth trajectories in their direction (as I also discuss in the PLoSCompBio paper cited above and in another one currently under review). 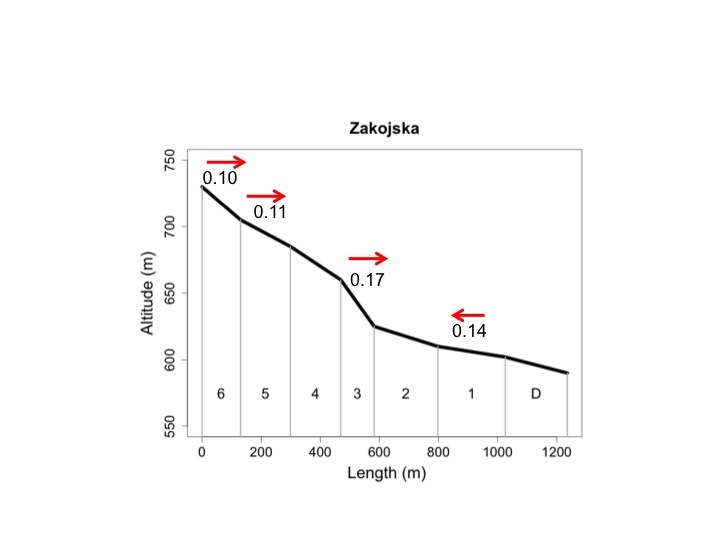 Vertical lines are standard errors of the estimate. Estimates of asymptotic length using the classic method (dots) and the random-effects model (triangles). The size of symbols is proportional to sample size. LIdri_MT = marble trout in Lower Idrijca, UIdri_MT = marble trout in Upper Idrijca, LIdri_RT = rainbow trout in Lower Idrijca, UVol_BT = brown trout in Upper Volaja. As I wrote in another paper currently under review: "The vBGF parameters can seldom be interpreted separately, especially when only a few older fish are measured; it follows that the analysis of the whole growth trajectories is necessary for understanding growth variation among individuals and cohorts". The second plot for growth shows the average growth trajectories using the random-effect models using data up to 2006 or up to 2014. Within populations and for all intents and purposes, the average growth trajectories are basically the same. Average growth trajectories for the 4 salmonid populations estimated with data up to 2006 or up to 2014 with the random-effects model. LIdri_MT = marble trout in Lower Idrijca, UIdri_MT = marble trout in Upper Idrijca, LIdri_RT = rainbow trout in Lower Idrijca, UVol_BT = brown trout in Upper Volaja. The last plot is about survival. x-axis is again the last year of simulated sampling, dot is the estimate of average survival, up triangle is the maximum estimated survival for a sampling interval, down triangle is the minimum estimated survival for a sampling interval. The estimate of average survival is very stable after just 2 or 3 years (4 to 6 sampling occasions), except for rainbow trout since the small sample size makes the estimate vary quite a bit, as expected. Dots are average survival probabilities (Phi(~1)), up and down triangles are maximum and minimum survival for sampling occasion (max and min estimates of Phi(~time)). LIdri_MT = marble trout in Lower Idrijca, UIdri_MT = marble trout in Upper Idrijca, LIdri_RT = rainbow trout in Lower Idrijca, UVol_BT = brown trout in Upper Volaja. 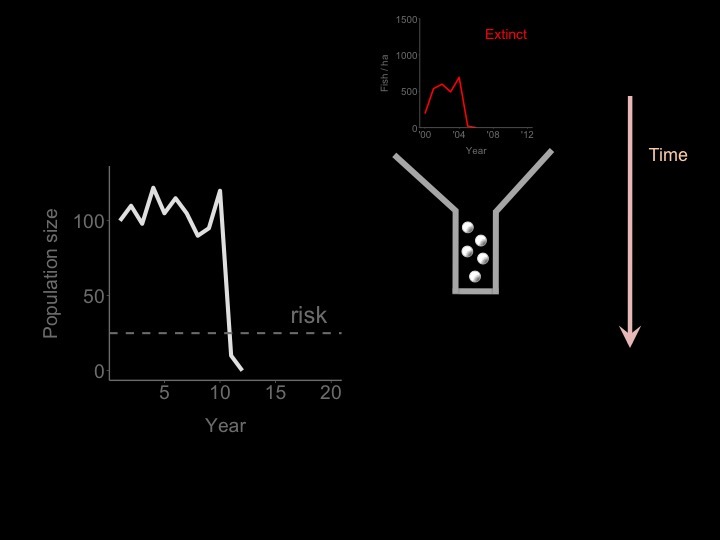 The main point and message to take home from this work are that in salmonid populations 2 or 3 years of data may be enough to get "stable" estimates of survival and average growth trajectories, the latter only if using a random-effects model of growth, but > 5 years are needed to estimate maximum and minimum survival probabilities in absence of extreme events (and potentially longer for minimum survival probabilities, as it can be seen in the panels for LIdri_MT and UIdri_MT). Interesting, surprising, useful, worthy of publication in a conservation journal such as Biological Conservation, Animal Conservation, Conservation Biology? A new manuscript I wrote with my long-term colleagues Marc Mangel, Dusan Jesensek, Carlos Garza, and Alain Crivelli has just been accepted by the Proceedings of the Royal Society B. This is the cover letter, in which I explain the high-level picture and some details of the analyses (it may help some junior scientists still struggling with cover letters, too much, too little, too many details or not enough etc.). We are pleased to submit our manuscript “Genetic and life-history consequences of extreme climate events” to PRSB. The climate change-induced increased frequency and intensity of extreme climate events is one the major threats to the persistence of species. However, when dealing with extreme events, finding the right model system, posing and testing tractable hypotheses on their demographic, genetic, and life-history consequences, and developing an overarching predictive framework is very challenging. First, climate extremes are rare events, and as a consequence most of the empirical studies on their effects have been opportunistic and anecdotal. Then, the demographic, genetic, and life-history effects of extreme climate events are not easily predictable or generalizable across species or habitats, especially when the investigations are not guided by ecological and evolutionary biology theory. In this work, we test – to our knowledge for the first time - theoretical predictions on the demographic, genetic, and life-history effects of extreme climate events on two populations of a fish species. The two populations have been drastically reduced in size by flash floods that occurred in 2007 and 2009. We used a statistically sophisticated approach that included reconstruction of pedigrees using long-term tag-recapture data (1995 to 2014 from one population, 2006 to 2014 for the other) and genotypes of more than 1,800 unique fish. In particular, we tested for faster life histories, higher variance in reproductive success, and loss of genetic variation after the extreme climate events. We are confident that our study significantly advances our understanding of the demographic, genetic, and life-history effects of extreme climate events on natural populations and would be of great interest to a broad audience of biologists. And here below is the abstract (I will soon post the pdf in the Publications page of the website). Climate change is predicted to increase the frequency and intensity of extreme climate events. Tests on empirical data of theory-based predictions on the consequences of extreme climate events are thus necessary to understand the adaptive potential of species and the overarching risks associated with all aspects of climate change. 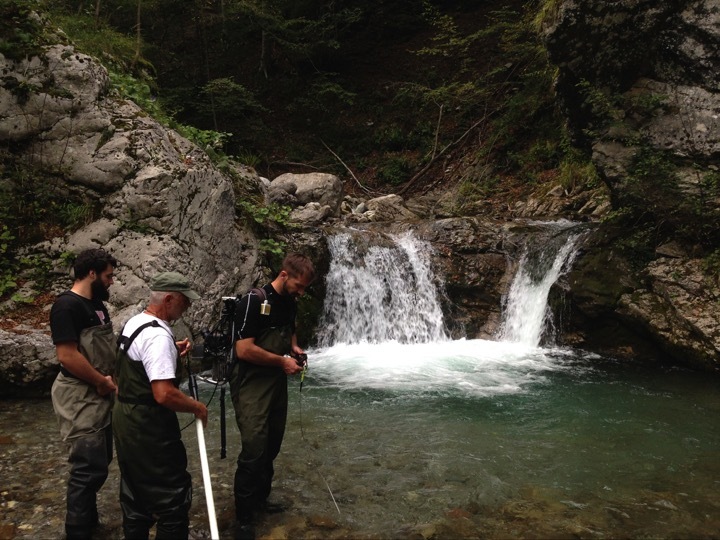 We tested predictions on the genetic and life-history consequences of extreme climate events in two populations of marble trout Salmo marmoratus that have experienced severe demographic bottlenecks due to flash floods. We combined long-term field and genotyping data, and pedigree reconstruction in a theory-based framework. 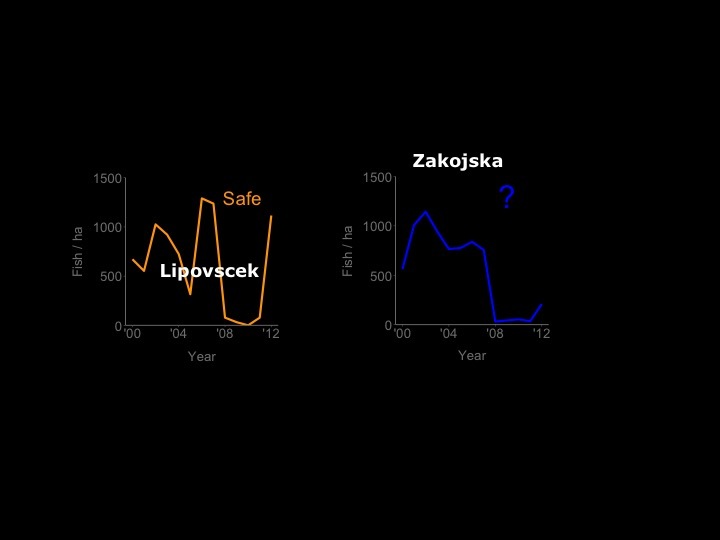 Our results show that after flash floods, reproduction occurred at a younger age in one population. In both populations, we found the highest reproductive variance in the first cohort born after the floods due to a combination of fewer parents and higher early survival of offspring. 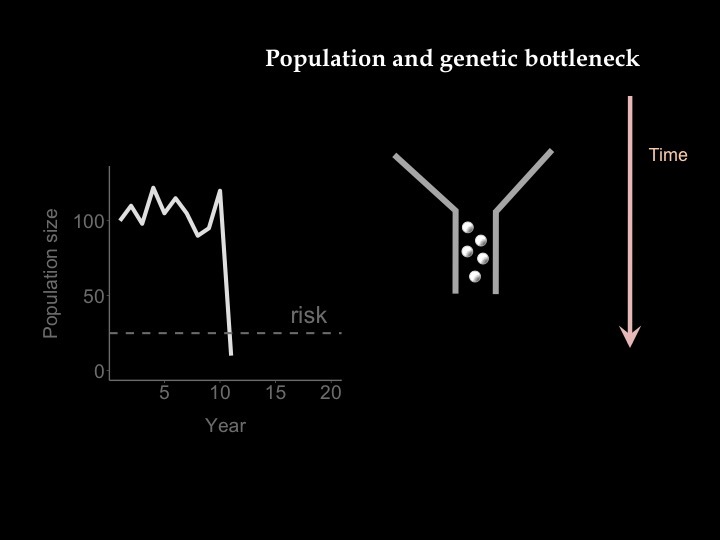 A small number of parents allowed for demographic recovery after the floods, but the genetic bottleneck further reduced genetic diversity in both populations. Our results also elucidate some of the mechanism responsible for a greater prevalence of faster life histories after the extreme event. These are some thoughts that I shared with one of my colleagues via email before submitting a revised version of the manuscript. "Brief thoughts. This paper is an example of interdisciplinary work. There is solid life-history theory, we built up from previous work thus giving the sense of solid foundations and a on-going narrative, some hard tests as envisioned by Platt (age at reproduction decreases or not after the floods), demography, classic genetics, and state-of-the-art pedigree reconstruction. Let's hope it gets accepted as is and we can then congratulate ourselves on an excellent, original work I am very proud of." This entry was posted in Paper accepted, Publishing papers, Research, Uncategorized, Work Stuff on January 3, 2017 by admin.